Four brief steps to take:1. Read about the CA Care Therapy first and decide if you are prepared to work hard to heal yourself. 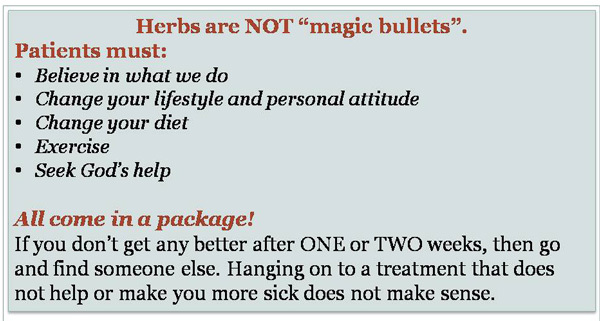 We offer no magic bullet. Healing is yours to work for.2. Come to our centre personally or send your loved ones who know about your case with all medical reports and scans. If you are from another country send us an e-mail. But we must say we are very reluctant to take on patients via e-mails.3. Fill in First Visit form.4. Sign the Disclaimer and Release of Liability form. We provide free consultation on first come first served basis. However, the elderly or seriously ill get priority over others. THE WAY WE WORK!We request you to do two things:1. You need to bring along all your medical reports and give us copies of them. In addition you need to fill in THE FIRST VISIT FORM.2. We require you to sign a Disclaimer & Release of Liability Form. You need to agree to release us from any liability and responsibility in the event that problems or complications arise from the consumption of our herbs. Based on the feedback you give in the First Visit Form and Medical Reports we shall prescribe the necessary herbs. It is therefore very important that you answer the questions asked adequately – give all possible details of your problems. An answer of No and Yes would not be able to help us to help you.